Vail  is a U.S. ski resort town set in the Rocky Mountains. Vail is located in the Northwestern region of the state of Colorado. It is 100 miles west of Denver and 35 miles (56 km) east of Eagle. Vail is roughly divided into four zones: West Vail, Lionshead, Vail Village, and East Vail. Most tourist activities are in Lionshead and Vail Village. Both locations have visitor centers with maps and information. The town has two distinct tourist seasons: winter, where the primary attractions are skiing and snowboarding, and summer. I-70 is a direct route into Vail. It's exactly 100 miles from Denver and about 130 miles from Denver International Airport. During peak times, I-70 can get very congested, and it is not unheard of for a trip from Vail to Denver to take three hours or more. Peak times are weekend afternoons (2-6 p.m.) both in the summer and winter. Plan accordingly and either leave in the morning, or leave Vail after 5 p.m. in the winter. If you do leave after dusk, however, be warned that road conditions can get icy. If you are from a major metropolitan area, the drive may also seem very dark to you with virtually no highway lighting and no reflectors on the roadway. Due to the darkness, high beam laws are often ignored. You can get a snapshot of travel conditions on the Colorado Highway Patrol web site . If you are not experienced with winter driving conditions, you may want to think twice about traveling to Vail by rental car. Although most of the time you'll find the highway dry and perfectly fine, when it snows, the road can get nasty. The ride from Denver takes you from 5,280' to the Eisenhower pass/tunnel at over 11,000'. After a steep drop to Silverthorne at 8,750', I-70 winds through Officer's Gulch, which is notorious for black ice conditions, high winds, and white out conditions when the weather is severe. I-70 then climbs over Vail Pass at 10,650' before the drop to the Vail Valley floor at 8,120'. If you are uncomfortable driving in the severe conditions that may occur on this drive, it is recommended that you spend a little extra money and employ one of the private charter services available in the Vail Valley. Scheduled and chartered services are available from Denver International Airport and Eagle County Regional Airport. Note that although some Denver based companies also offered chartered service to Vail, their drivers often have limited experience in severe weather. Many Denver charter companies also use all season tires in the winter. If you do a little research, you should be able to find a reputable Vail based company that uses studded snow tires during the winter. Most visitors fly into Vail/Eagle County Airport (IATA EGE) or Denver International Airport (IATA DEN). If you fly into Denver, you might think about renting a car, but you should be warned that the 100+ mile trip from Denver takes you over two mountain passes at elevations of 11,000 and 10,600 feet. The safest way to get from Denver Airport to Vail is to take a private chartered service such as Black Diamond Private Transportation that employs experienced drivers that are familiar with the drive and road conditions. Note that Vail/Eagle County Airport is still about 35 miles from Vail. A shared ride in a van from the airport to Vail will cost you about $70 per person. If you are traveling with your family or in a group, there are a number of private charter services that are also available. These are often more convenient than a shared ride service since they transport you door to door. Although you might think about renting a car, parking is expensive in Vail, and most everything is in walking distance or a short ride away on the town's extensive free bus system. Another option from Eagle Airport is to use the county bus system (ECO). The bus stop can be difficult to find. Exit the airport out the front door, make a right, and walk about 100 feet to the bus stop. The bus takes about 80 minutes. It runs from Eagle airport through most of the towns and goes to the Vail Transportation Center. The cost in 2011 was $4 each way. Several carriers offer limo, van, or bus service to and from Aspen, Denver, and other cities in Colorado ($300 one-way), or the Eagle Vail airport ($100 one-way). Greyhound will be the cheapest at $26-38 one-way with advance purchase. Peak 1 Express, +1 970 724-7241, . Provides shuttle service between Vail and Denver International Airport. If you are staying in Vail or Lionshead, having a car will be more hindrance (parking fees) than a value. The town is set up so you can walk between most places and the slopes. There is also a free shuttle that will take you to the immediate surroundings as well as up to Beaver Creek. A Cassin's Finch clings to a feeder at the Vail Nature Center in Ford Park. Most major car-rental firms are located in Denver and Vail airports. If you are coming from outside of Vail to ski, you can park on site. It will cost about $25 (2010) per day. Arrive early (before 9 a.m.) on busy days and you won't have problems. There are two parking garages, one in Vail Village and one in Lionshead. The Lionshead garage is the shortest walk to the slopes. If the garages do fill up, you may park on the road. The problem is that they don't let you park on the road until BOTH garages are filled. During the summer season, the garages are free. For those doing child care, there is also ($25/day) valet parking at Golden Peak. It's cheaper to park at the main Vail garage and walk (5 mins). Most hotels in Vail will provide you with a free shuttle, just ask before you arrive. You can rent large passenger vans for groups with Switchback Van Rental . The town runs a free bus service that connects all zones with the center of town. Schedules vary by season. For current schedules see: . Colorado Ski and Snowboard Museum,  - Currently undergoing renovations and scheduled to re-open for 2017-18 ski season. Betty Ford Alpine Gardens,  - The highest elevation botanical garden in the world. Free, donations accepted. The Eagle Bahn Gondola transports people to the top of Vail Mountain in both summer and winter. Websites snow.com or vail.com have seven day advance internet purchases with highly discounted rates. The Epic Pass provides unlimited slope access at Breckenridge, Keystone, and Arapahoe Basin, as well as 10 days of access to the lifts at Vail or Beaver Creek. The Epic Pass costs around $500. It is blacked out on certain dates and must be bought at the beginning of the season. Some users have been able to find discounts on Ebay. For example, for $10 you can buy a 2 for 1 coupon that was issued somewhere in the country. However, there have been counterfeits reported, so your mileage may vary. If you have friends in Vail, and they have a season pass, they get five "Buddy Passes" that allow you to ski for ~$80 a day. Start at Golden Peak and take the lift past the first drop off to the top. Get off and take lift 11 (Northwoods) to the very top of the mountain. From there, drop into China Bowl or go off to Blue Sky basin. Come back to the front after noon, and you'll see a lot of the mountain. If starting at Vail Village, if the Vista-Bahn is really full, take the little two seater chair up. They do not run the two seater chair except for races. Ski over to Golden Peak and follow the same instructions from above. If starting at Lionshead, don't wait for the gondola, take the quad chair. Ski over to the far side (the far side can be LOTS shorter) of lift 2 and up. Avoid Chair 4 from mid-Vail as it is always crowded. Chair 11 can get crowded as well. Check the status boards for the back bowl lift and game creek bowl lifts before going into each as they can fill up, and there is only one chair in each bowl. Located at the base of the ski slopes, Pirate Ship Park has delighted generations of children in Vail. Child care Vail has an excellent child care center for all ages of kids. For babies to toddlers, the nursery provides great, on mountain care. It is recommended that you book early for the nursery (like a month before you get there). They do fill up. Travel Vail Baby  provides quality baby and toddler equipment rental including - but not limited to - cribs, strollers, high chairs, car seats, hiking backpacks, pack-n-plays, swings, toys, humidifiers, and more. 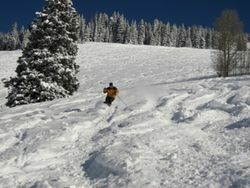 Rental items can be delivered anywhere in Vail, Beaver Creek, Bachelor Gulch, Arrowhead, Avon, Edwards, and Cordillera. Avoid the hectic security checkpoints and costly baggage fees and just bring the kids. The Ski School can teach kids as young as three to ski and give them a fun day, too. These options do not come cheap, but you get a good quality product and don't have to worry about your kids. Ride the Gondola The Gondola is free for foot traffic after 3:30pm. Before 3:30 p.m., the ticket price is $30 for adults and $19 for children (2013). It is the only way to get the non-skiers and the kids up to the top before 3:30. Adventure Ridge A fun place to bring kids or friends who don't like to ski. Activities include: ski-biking, kid's snowmobiling, and tubing. Vail snowmobiling tours and rentals  Take a guided snowmobiling tour in Vail's back-country or set out atop Vail Pass on an unguided snowmobile rental. Designers worked hard to maintain a European aesthetic to Lionshead condos and shops. Gondola rides There are two gondolas in town, one in Vail Village (Gondola One) and one in Lionshead (Eagle Bahn Gondola). They generally run from early June to early October. Check the schedule as they may not run daily. In the summer of 2017, the adult (ages 13 and up) fare was $36 for a day pass good on both gondolas. Discounts are available for children (ages 4-12) and seniors (65+). You may bring a bicycle with you by paying for a bike haul ticket. At the top, scenic views, hiking, biking, dining, obstacle courses, and other activities are available. If you want a work out and want to save money, hike up to the top. The Gondola is always a free ride down! The hike will take you about 1-2 hours (depending on fitness). Take the Berry Picker trail from Lionshead or the Strawberry Lane trail from Vail Village. Vail Bike Tech  Located on the Lionshead Mall. Road cycling The town is bike friendly. There are several trails that will take you around town. The main roads leave room for cyclists. Hiking There are trails throughout the town. Some are paved and shared with cyclists. Hiking maps are available at the visitor centers. Piney Lake A gorgeous view awaits you if you brave the 12 mile dirt road up to the Piney Lake north of town. You can rent a boat at the Piney River Ranch, which also has dining and lodging accomodations . Summer horseback riding at Piney River Ranch. Nova Guides  Based between Vail and Leadville and offers trips on the Eagle, Colorado, and Arkansas rivers. Door-to-door transportation from your hotel is usually included. Also offers jeep tours and winter activities. Timberline Tours  Based in the town of Eagle and offers trips on the Eagle, Colorado, and Arkansas rivers. Door-to-door transportation from your hotel is usually included. Also offers jeep tours. Also offers group chartered transportation services. Since the company uses its buses during the day for rafting trips, their seats may often be wet for early evening movements. Whitewater Rafting, LLC  Located on the Colorado River down-valley in Glenwood Springs. Rock Gardens Rafting,  Specializes in family float trips down the milder waters of the Colorado or Roaring Fork rivers. Also offers jeep tours on the nearby flat-tops. Dvorak Expeditions,  Specializes in longer and multi-day trips in rivers across Colorado. They do yoga, classical music (a raft with a quartet goes along), and fly-fishing multi-day trips. Eagle Ranch Golf Course,  An Arnold Palmer Signature Design. The course plays through the Brush Creek Valley and offers panoramic views of the Colorado Rockies on every hole. Cotton Ranch Golf Club, . A golf community that welcomes the public. There is a restaurant that serves lunch daily and dinner nightly. Black Mountain Colorado Dude Ranch, . Week long all inclusive vacations living on a full service Texas Longhorn cattle ranch north of Vail. Vail has all your typical resort shops. These are located in Lionshead and Vail Village. One store that is uniquely Vail is the The Golden Bear , a jewelry store known for its line of jewelry featuring a Golden Bear. Vail also has a farmers' market and art show that runs on Sundays during the summer months in Vail Village. For standard grocery stores, head to West Vail. There is also a small market in East Vail. See above in the Eat section for some towns near Vail. Beaver Creek is right down the valley. Glenwood Springs is a beautiful one hour drive, west on I-70, from Vail, and you can enjoy the town's famous hot springs when you arrive. Aspen is a two hour drive away. Rocky Mountain National Park is about a two drive to the northeast. This page was last edited on 22 March 2018, at 18:37.